What are speaker notes? 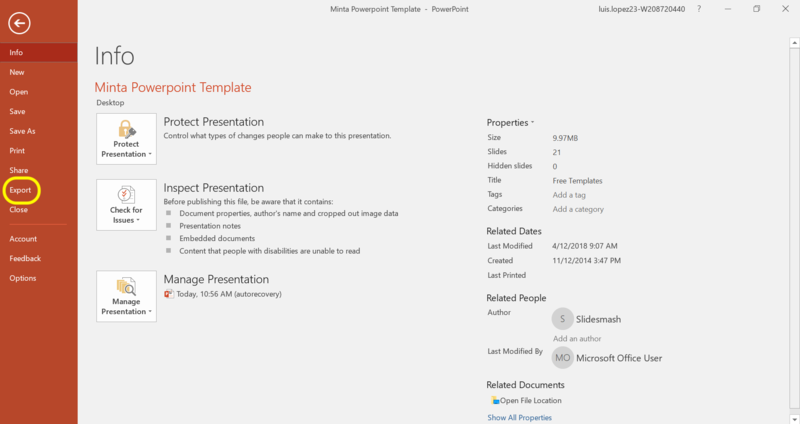 Well, speaker notes are the notes added to the presentation as the presenter’s reference. 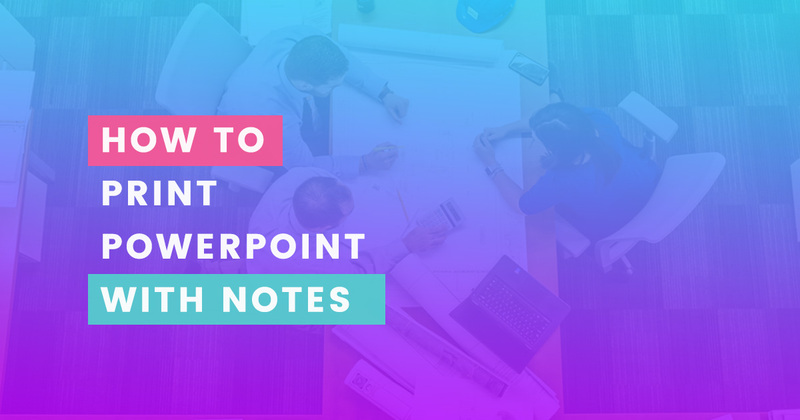 These notes include important information, details, or comments to mention when presenting. Anyone who gives a speech, presentation, or lecture in front of an audience has notes to stay focused, like the president, t.v. hosts, news anchors etc. Many people use notes in their presentation to be calm, and be able to inform the audience of everything they need to know. No one in the audience would see this notes, they are only for the speaker’s personal use. 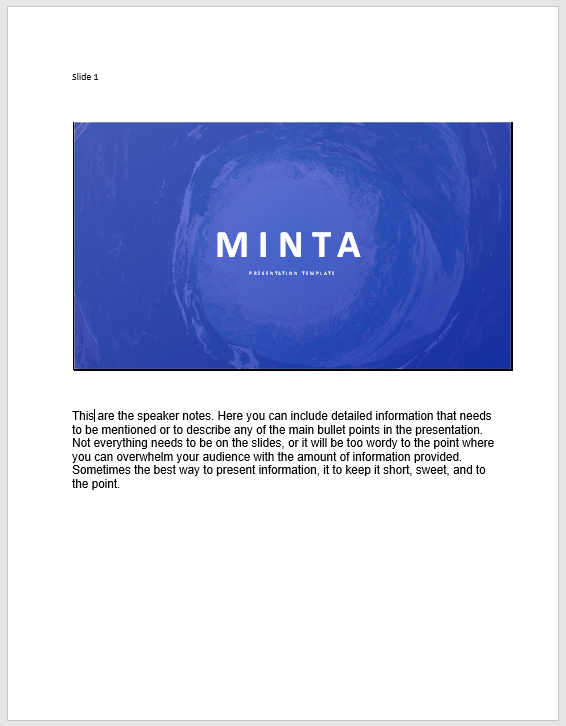 One of the benefits of printing the speaker notes along with the presentation is that it helps the presenter follow along with the audience without having to look back at the presentation, and give their back to the audience. Why are speaker notes important? One of the biggest mistakes to make when presenting is reading off the slides word for word. If people can see it and read it, then you should not be reading for them. In order to make a good presentation, you should be able to talk about each slide and be able to talk about each point being presented. Giving a presentation may be nerve-wracking making it easier to lose your train of thought and forget everything you wanted to say, which is where the notes come in handy. It is recommended to use notes to organize your information and ease your nerves. Using notes gives you more to talk about and it is a great way to summarize the information being presented. In addition, it gives you more to talk about the subject and it’s an assurance way to make sure you don’t forget any important details needed to be mentioned to your audience. How do you want your notes? There are multiple ways to print out your presentation notes. 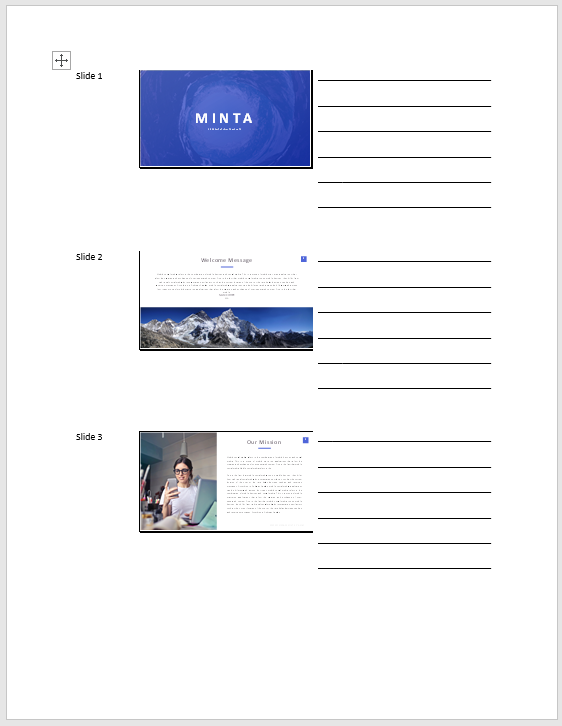 You can print out each slide as a handout, have multiple slides on a hand out with each slide’s notes, or you can finish your presentation and hand write your presentation notes. Everyone is different, and have different ways to organize their information. Similarly, everyone has different ways to present their information. For this reason, we have provided 4 different ways for you to print your speaker notes or hand out with a provided area for notes on the handout. We are going to show you step by step how to print out the speaker notes with the presentation. So, follow along and find the way that would better suits you. When you start creating your presentation you will notice that below the slide is where you have the space for your notes. 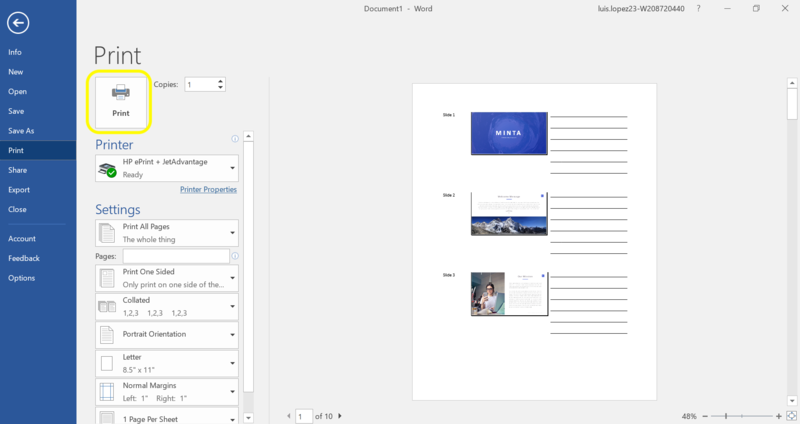 You can write your notes while you create your presentation or after you have completed the presentation. 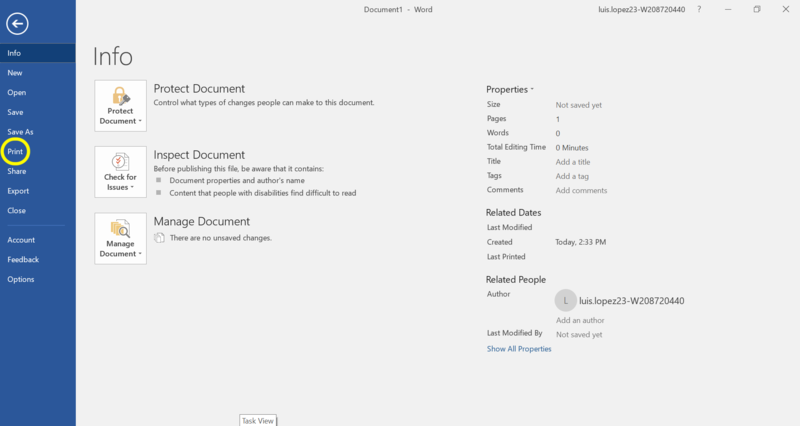 You can write as much as you want in your notes section. This is for your own and personal use, whether you want to add jokes to mention in presentation, some fun facts, or important comments and opinions. First, you want to locate the Files tab, which will be in the top left-hand corner. Second, when you are in files, you want to look for Export. 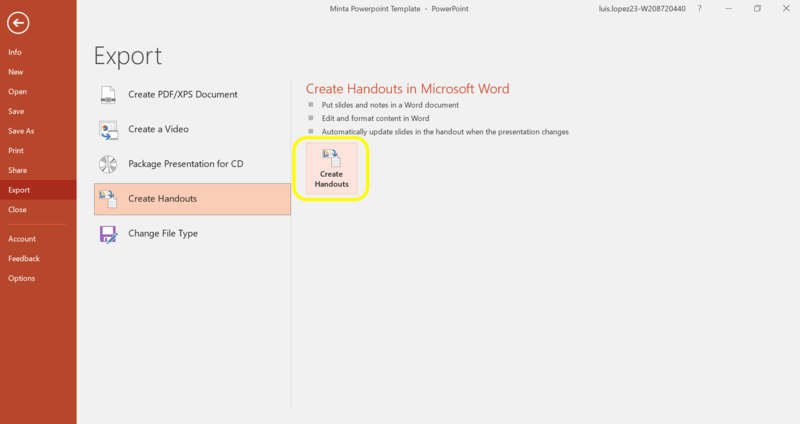 Third, after you click on Export, you want to click on Create Handouts. Step 4: What type of hand out? 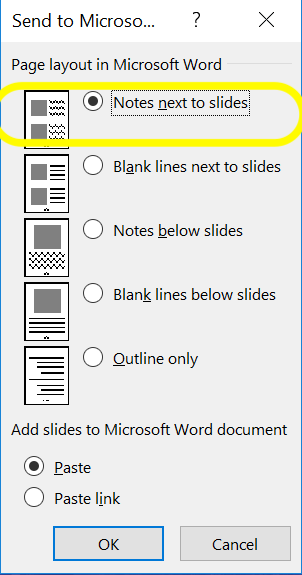 When you click on Create Handouts, this box will pop-up with options. 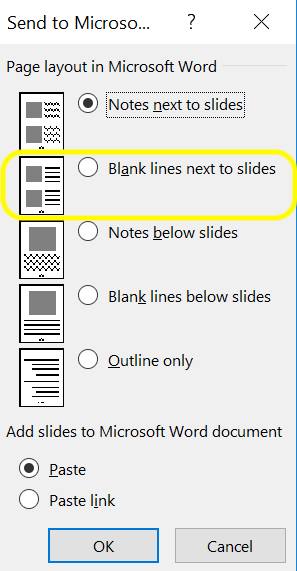 These are the options you could have to print out your PowerPoint with your notes. All you have to do is pick the option that best suits you and click on the OK button. 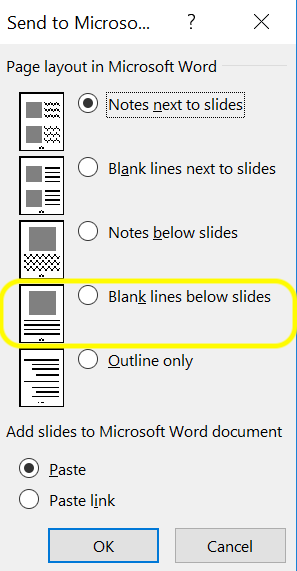 Your speaker notes would be next to the slide it corresponds to. 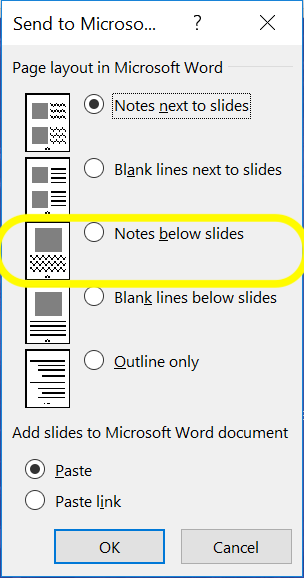 This makes it easy for you to have your notes and slide side-to-side. 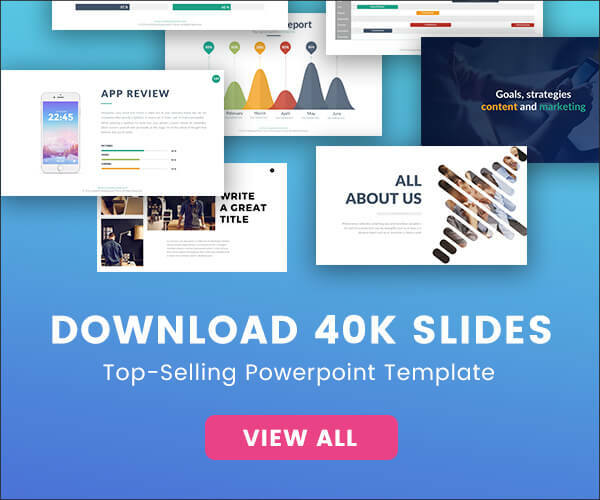 You can have multiple slides on the handout, and you won’t have to keep looking back at the presentation because you will have all you need in your hands. Similar to A, the notes can be written next to the slides, it’s just that you hand write them rather than have them typed up. This layout is great and popular for students. 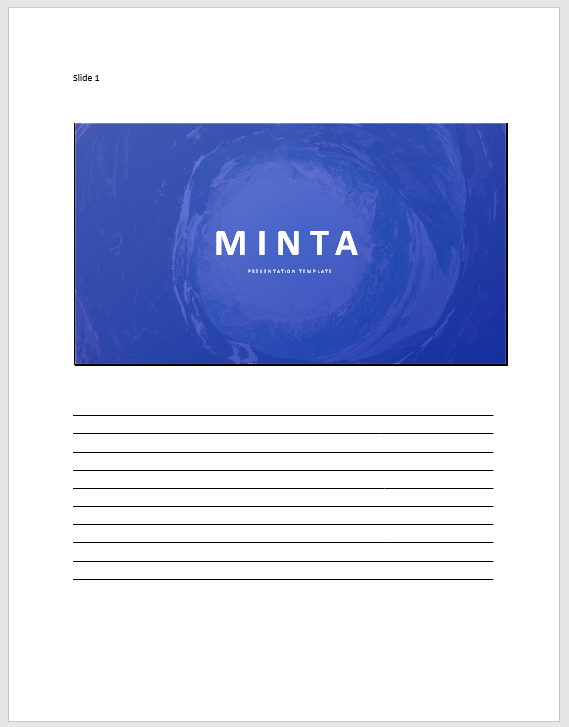 Many students like to have the presentation printed out, and add extra notes next to the slides to study. This is also great for speakers who are kinesthetic learners and can memorize information when written. When you write down the information you have a better chance of remembering, than typing it up. 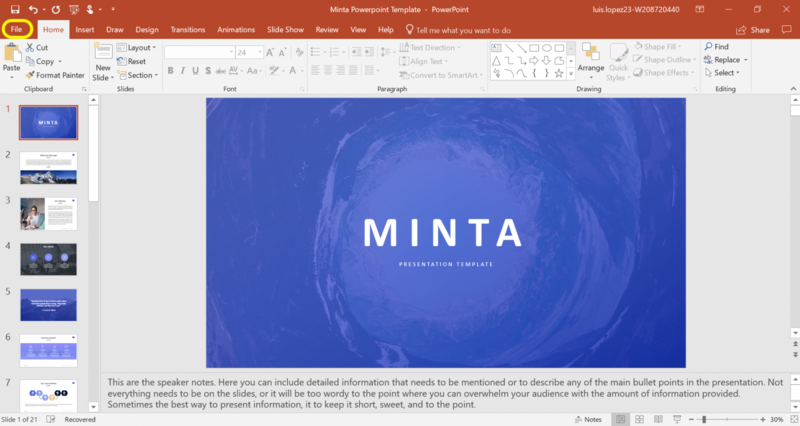 For a presentation that is minimal, but you still want to be able to have an in-depth discussion and add more information verbally, than this handout would be perfect for you. 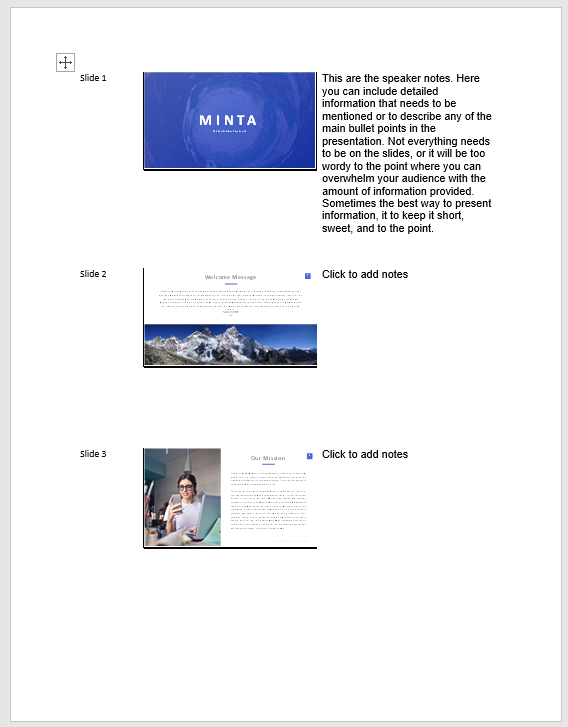 This hand out is one slide per page and you can add as much information as you want to add below the slide. This is similar to handout C, but this one provides the lines for you to hand write your notes below the slide. 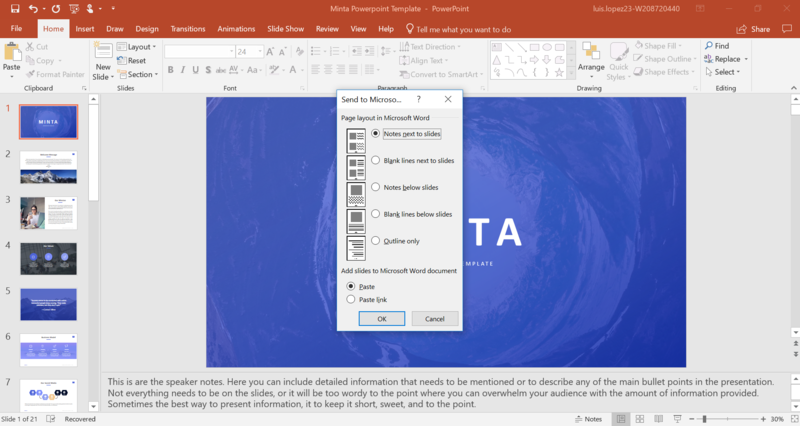 When you have chosen the handout you want for your powerpoint and notes, you will choose your page layout and click okay. 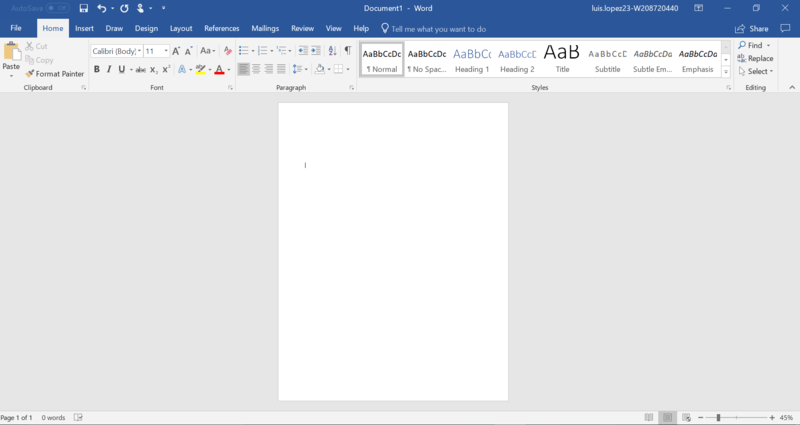 That will then open up Microsoft Word. 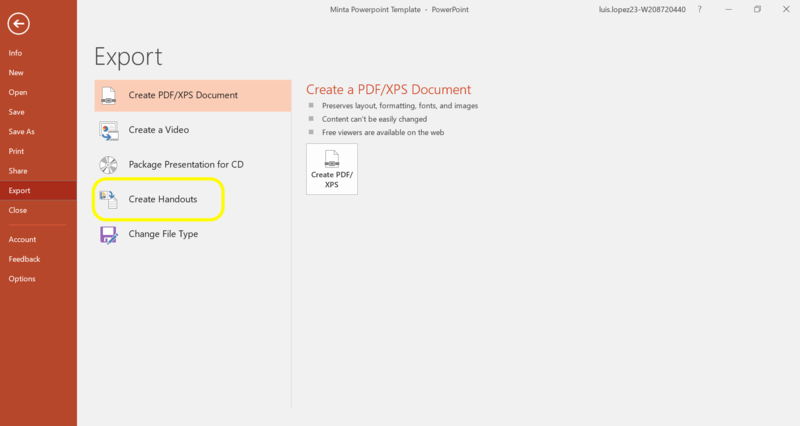 Once your handout has been created you are going to click on the Files tab. That will then give you a page with a lot of options, and you will look for Print. Once you found Print, click on it and another page with options will come up. 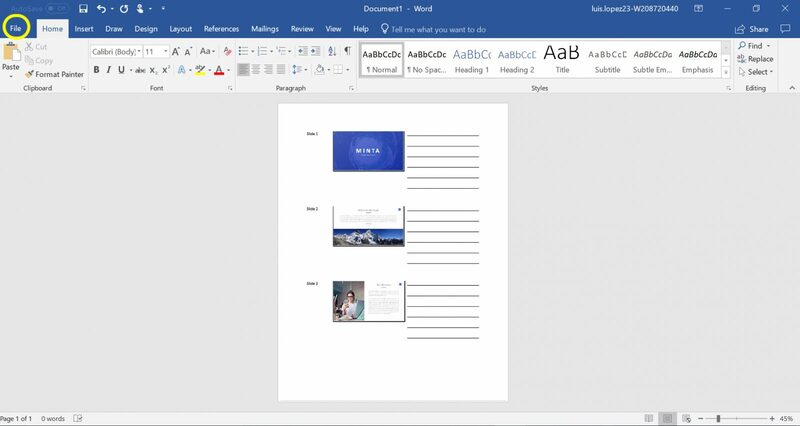 Since this is your hand out, when you come to this page, you have the option to change that margins, make you hand out one or double-sided, print multiple copies, and a lot more options. On the right, you have a preview of what your handout should like when you press Print. When you are done, make sure your computer is connected to a printer, press print, and you are done.